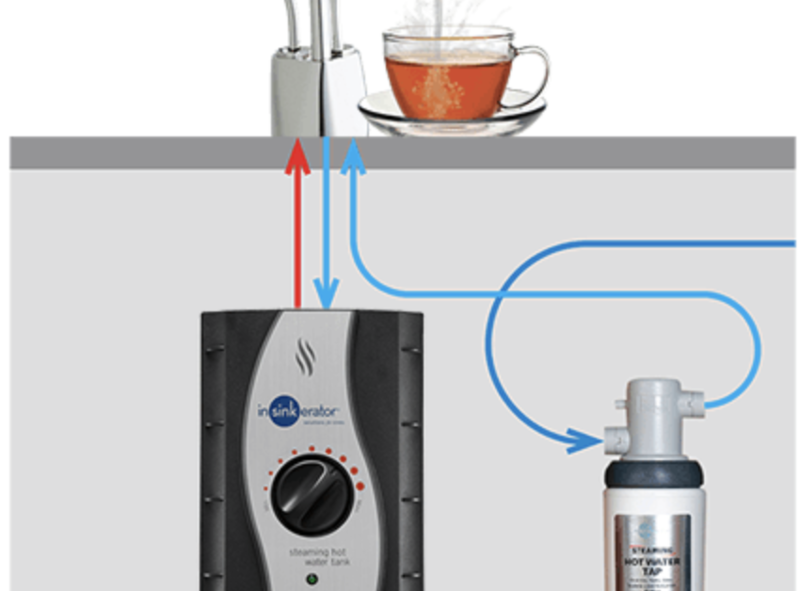 Do you ever wish you had instant clean hot water at your fingertips whenever you wanted? That cup of tea, that cup of cocoa, a cup of soup. Many of us during the winter months enjoy having hot beverages but warming up the water on the stove can be a pain and heating up water in the microwave has studies showing that it isn’t healthy. What are we to do then? There is a solution that offers you clean instant hot water right at your kitchen sink. When I upgraded my kitchen sink I added an Insta Hot to my kitchen and I absolutely love it! I love that just as quickly as I can turn on my spout I have instant, almost-boiling, hot water that has been purified through my reverse osmosis. I love that if I want a cup of tea I can have it in seconds without the hassle of heating up water on the stove or killing my water in the microwave. I enjoy being able to make hot cocoa in a matter of seconds, a cup of noodles – anything that you would need to heat up water for, it is already instantly hot and ready to go. Near-boiling water on-demand, it isn’t science fiction, it is an affordable and convenient way to have instant hot water at all times. 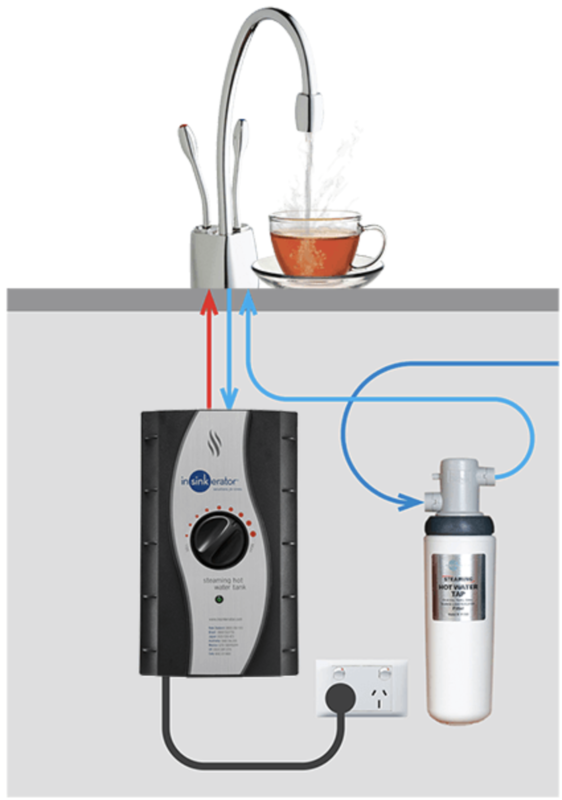 The way most residential instant hot water system works is quite simple. First, the system is tied into the kitchen sink’s water supply, which is then connected to the insta hot. The tank mounts under the kitchen sink and keeps 2/3 gallons of water at near-boiling temperatures at all times. As hot water is used from the spout, it’s replaced in the tank by cool water, which is quickly heated. A thermostat monitors the water temperature and instantly turns on the heating element to keep the water in the tank at near-boiling temperatures. If you do not have a filtration system on your home, we highly recommend having a filtration or reverse osmosis system tied into the cold-water supply before it goes into your instant hot water system so that you have great tasting hot water for both drinking and cooking. If you go with this route there is a special spout as pictured allowing both hot and cold water from the same spout for a clean and simple look in your kitchen. This pout can be ordered in a multitude of finishes. One of my favorite tips as a user for several years now on the instant hot water system is using the instant hot water for cooking. I don’t have time to watch the grass grow and I don’t have time to watch water come to a boil. I have become quite spoiled not waiting for water to boil on the stove anymore, I cheat. I fill up my pot of water from the Insta Hot and then put it on the stove, seconds later the water is boiling and I am cooking with filtered hot water which makes me feel better about what I’m cooking for my family.